The last time I visited Taipei, I stuffed myself silly with its delicious, mouth-watering street snacks. Fiery and tender chicken cutlet, lu rou fan, sweet potato fries and even boba milk tea… Some days, I still dream of it in my sleep. 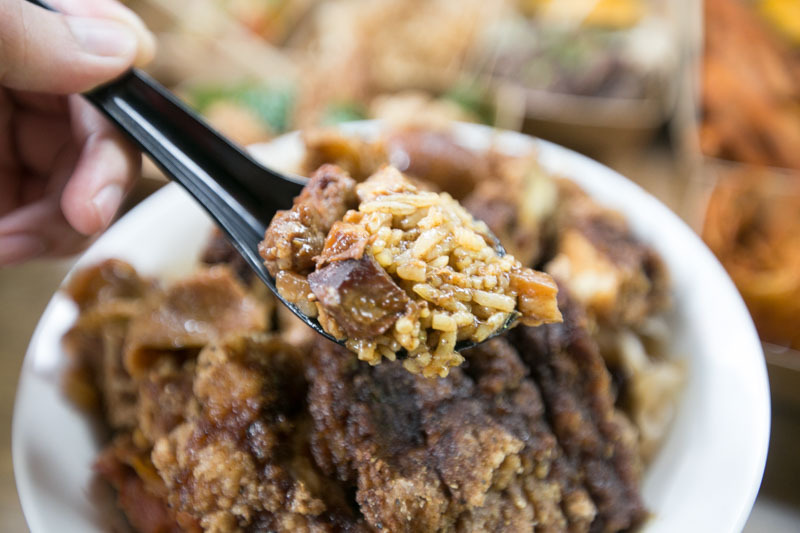 Imagine my delight when I found out that 爺 YEAH Taiwanese Street Food, a food truck located at Timbre+ near one-north, dishes out virtually every dish present at Shilin Night Market and more! Operating from a rustic fire-engine red food truck, everything about 爺 YEAH Taiwanese Street Food reminds me so much of Taipei. 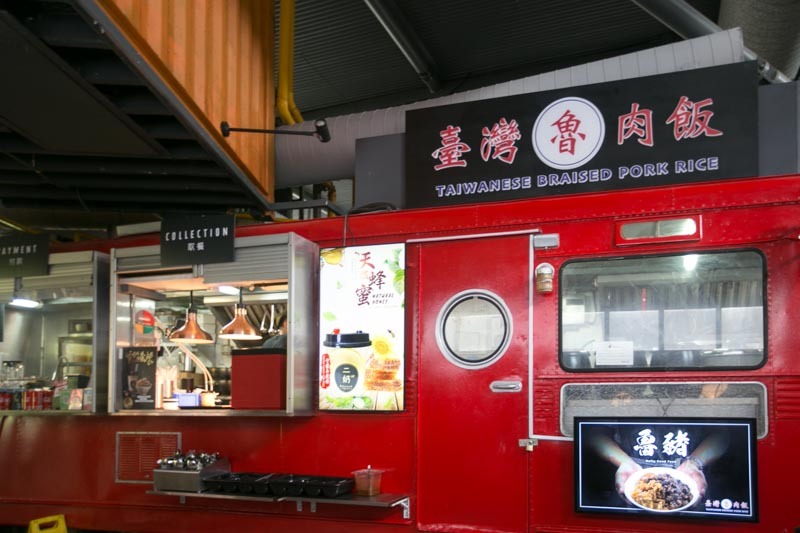 From its kiosk-like front, where you’ll collect your food from, to even its extensive menu which covers meals, snacks and drinks… It’s just like stepping back into the bustling streets of Taipei. 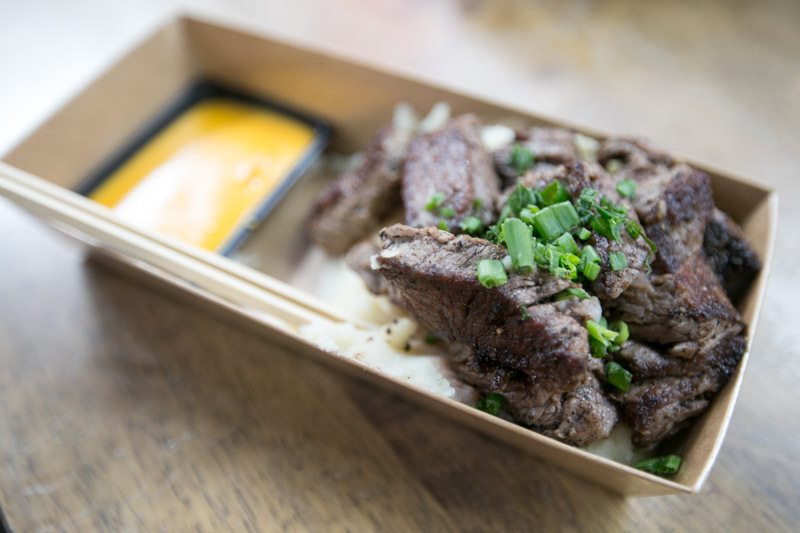 爺 YEAH Taiwanese Street Food is situated in Timbre+, a bustling gastropark which serves a variety of restaurant-grade food. 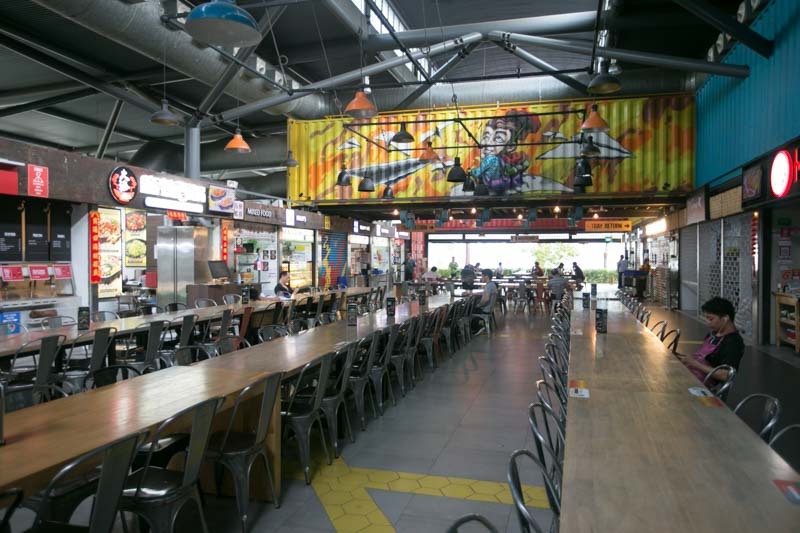 The selection ranges from old to new generation hawkers, and is accompanied by live music at night. While I visited during off-peak hours and was greeted by a relatively empty space, I was told that it can get pretty crowded (and stuffy too!) during lunch and dinner hours. Don’t be surprised if you have to jostle with the working crowd for a seat! Starting off my meal was the No Mercy (S$10.80), a gigantic four-meat rice bowl that included braised pork, three cups chicken, fried pork chop and fried chicken steak. It also came with a braised egg and braised cabbage, and a large amount of rice was hidden under all that meat. If all that meat is throwing you off, don’t worry. 爺 YEAH Taiwanese Street Food also serves Double Up (S$6.80), a two-meat rice bowl combo and Triple Up (S$8.80), a three-meat rice bowl combo. They also have individual rice bowls such as Signature Braised Pork Rice Bowl (S$4.50) and Fried Pork Chip Rice Bowl (S$5.80). 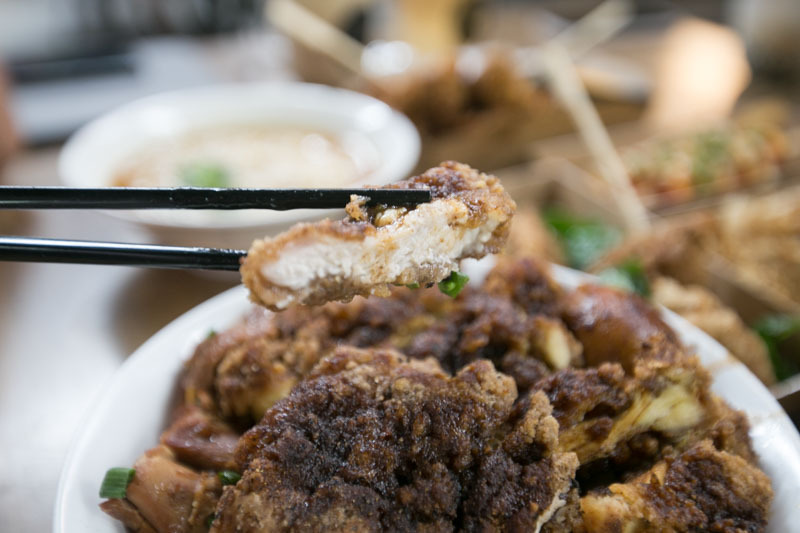 A popular Taiwanese street food staple, the ji pa, or fried chicken cutlet, was cut into thin strips and perched at the very top of the mountain of rice and meat. While it was a tad dry, the ji pa was certainly heavily marinated and filled with flavour. 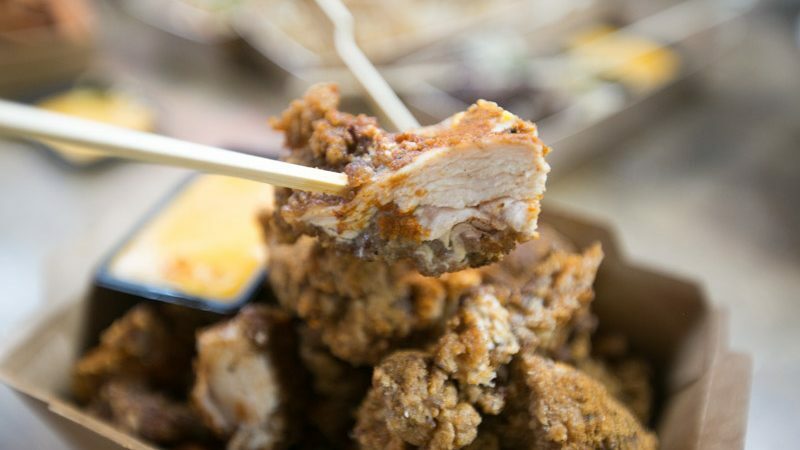 The fried chicken strips had been sprinkled with a fiery and aromatic spice, with a hint of sour plum that gave it a tangy aftertaste. There was an audible crunch when I bit into the fried chicken cutlet, which was a definite sign that it was deep fried till crisp. It might’ve been because the chicken steak was thinner than usual, which made it dry when deep-fried, but I’m not complaining. I love a good ol’ crispy cutlet. 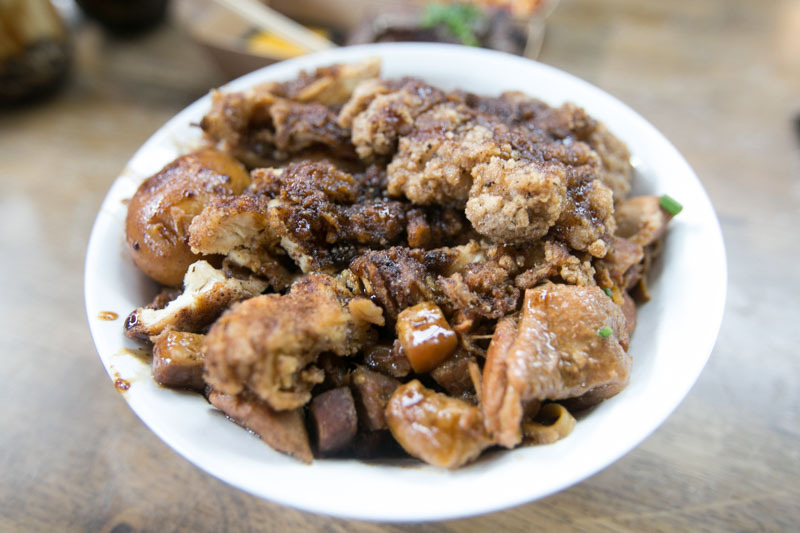 What I absolutely loved about 爺 YEAH Taiwanese Street Food’s No Mercy was its lu rou. The braised pork was soft and tender, with a good amount of fat that made each spoonful melt-in-your-mouth worthy. Flavour-wise, it hit the spot. The lu rou was coated with a good amount of sticky-sweet soy sauce and there were smoky bits of charred shallots and onions. The best part was that the thick sauce had seeped into the white rice, so every mouthful of rice was juicy and moist. My only gripe was that the lu rou was hidden deep under the layers of fried chicken and pork, so I had to dig quite a bit to find it. But then again, I suppose having too much meat could be considered a good problem too. 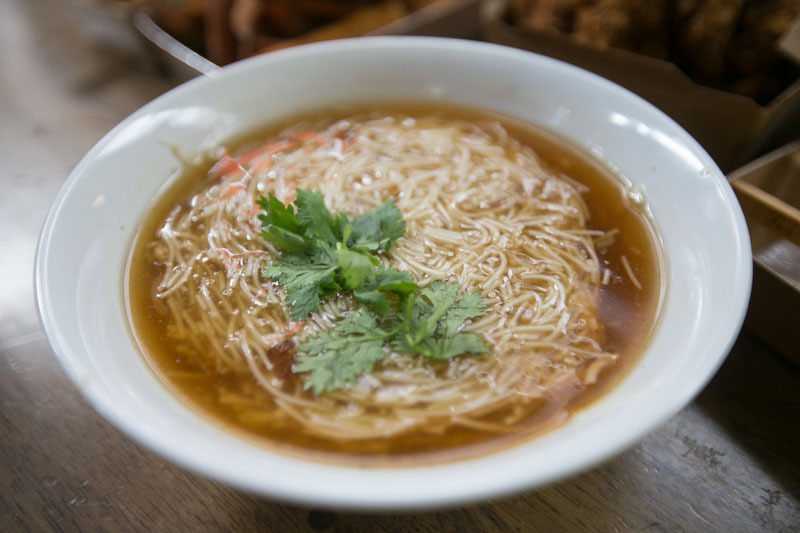 Moving onto another classic Taiwanese street food, the Signature Mee Sua (S$2.80) was a simple bowl of wheat vermicelli cooked in a rich bonito-flavoured thick broth. While this bowl of mee sua came without any ingredients, 爺 YEAH Taiwanese Street Food offers three other types of mee sua: Shredded Chicken Mee Sua (S$4.80), Braised Pork Mee Sua (S$5.80) and Crabmeat Mee Sua (S$8.80). The vermicelli was silky-smooth and the starchy soup tasted like dried cuttlefish, bonito flakes and oysters. Adding fresh coriander to the mee sua also gave it a refreshing citrus kick. I’ve always had my mee sua with an ingredient or two such as oysters or shredded chicken, so this was my first time having it plain. I was pleasantly surprised by how simple and indulgent the bowl of piping hot mee sua was. 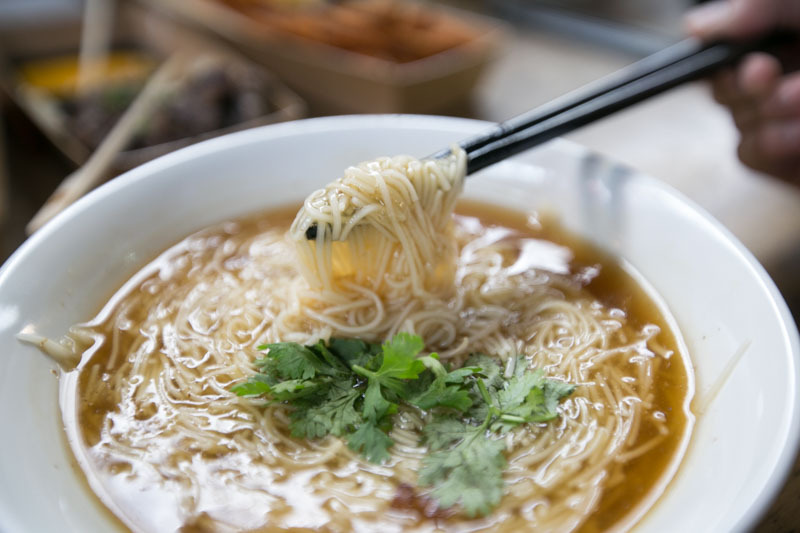 Aromatic and tasty, it had with a strong taste of bonito, and I slurped up the entire bowl of mee sua effortlessly. One of my all-time favourites, the Insane XXXL Chicken Steak (S$6.80) was dusted with a spicy powder and served with nacho cheese dip on the side. We chose the spicy option, and it was peppery hot with a good amount of sour plum powder. After a couple of bites, I caved in and reached for the nearest drink. You’d expect the spicy powder to make the fried chicken dry and tough, but each piece was juicy and tender. I’d certainly say that XXXL was a good description of the chicken steak; this serving could feed at least three or four adults comfortably. Dipping the fried chicken cutlet in the cheesy nacho sauce seemed a little overly indulgent for me and I preferred to have the cutlet as it was. If you’re one for sauces, then this would certainly be for you. Being a huge meat lover, I really looked forward to the Flaming Beef Cubes (S$10.80). Sprinkled with chives, it came on a bed of mashed potatoes with a nacho cheese dip. What I really liked about the beef cubes was how well it was seared. I could taste the charred, nutty and smoky taste from its time under the blowtorch, and each piece was well-seasoned, with a fine sprinkle of salt and ground black pepper. I found some of them to be particularly tough, and it took extra jaw work to completely chew one down. Perhaps it’s because they were of irregular sizes, resulting in uneven cooking when being grilled and blowtorched. One side dish that my dining companions all unanimously liked was the Sweet Potato Fries (S$4.80). 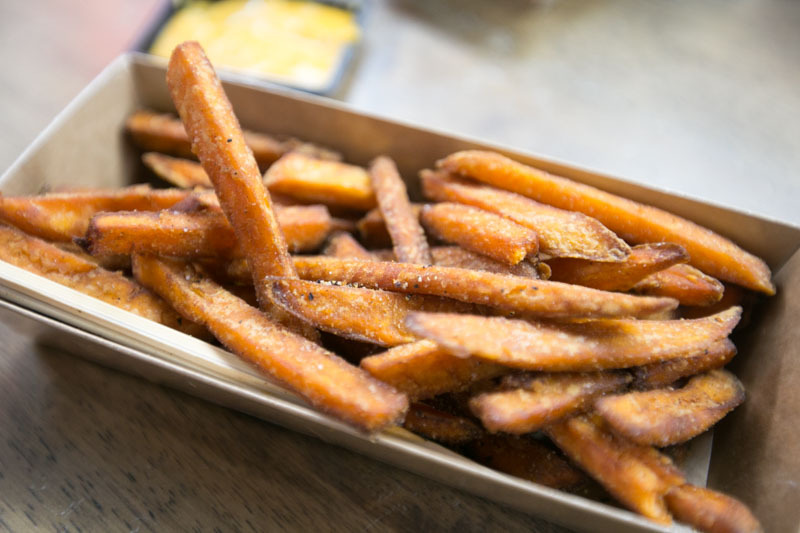 Sprinkled with salt and ground pepper and fried to a glorious crisp, it was incredibly addictive. There was just something about its smoky and savoury taste that made it almost impossible to stop eating. 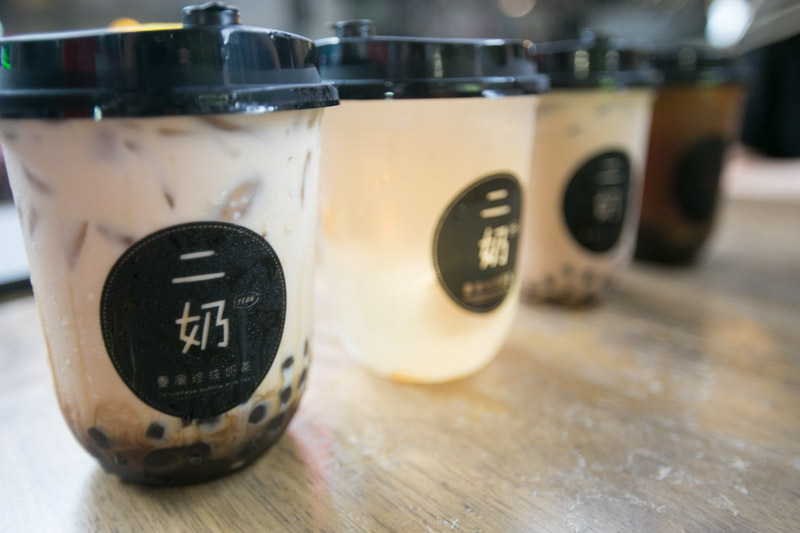 Last but not least, we ordered a variety of drinks such as Okinawa Brown Sugar Milk (S$4.90), Lychee Rose (S$2.80), Signature Boba Milk Tea (S$3.50) and Passionfruit Black Tea (S$4.50). Out of the four, my personal favourites were the Okinawa Brown Sugar Milk and the Lychee Rose. I found the Okinawa Brown Sugar Milk light, and every sip was refreshing and smooth. I enjoyed the occasional bursts of honeyed sweetness from the brown sugar pearls, which were cooked just right. They weren’t hard in the centre or overly chewy, which is a major plus. The Lychee Rose was almost too sweet because of the overpowering syrupy lychee, but I really enjoyed the way the drink settled down in my mouth. I could slowly taste the flowery lightness of the rose syrup, which was complemented really well by the delicate aloe vera toppings. What made 爺 YEAH Taiwanese Street Food so special to me was because it offered so many different kinds of Taiwanese street snacks, some of which I can rarely find in Singapore. Affordable with generous portions, the food was also addictively delicious and packed with lots of flavours. However, the venue was pretty hot and stuffy and we had to constantly swat away flies during our meal. That being said, I’d go back again whenever I’m craving a mouthwatering bowl of melt-in-your-mouth lu rou fan or crispy chicken cutlet.